McAuliffe recorded 14 bagpipe selections for Edison's National Phonograph Company from 1899 through 1903. 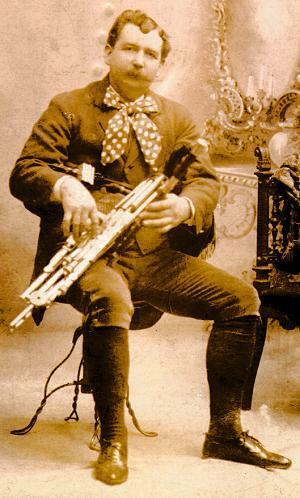 James C. McAuliffe with his Irish (uilleann) bagpipe. Date uncertain (1890s?). A humorous story about this photo . . . Working in a penitentiary at the time, John brought this photograph to work with him one day to have it framed. An inmate of the prison asked, "What is that, a Gatling gun?" The prison psychologist remarked to John that the inmate showed "the typical criminal response: anything tubular must be a weapon." Later, when John brought the framed photograph home, his father asked, "What is that, a Gatling gun?" Tintype (ca. 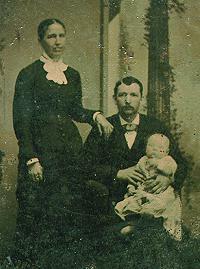 1880) of wife Ellen S., James C., and son William. 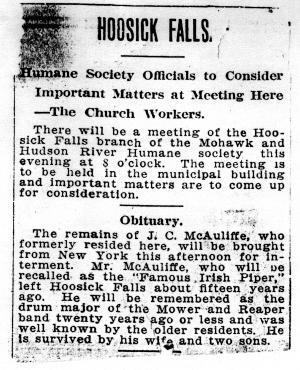 Photocopy of obituary, Standard Press of Hoosick Falls (New York), date not known.